Cochabamba (Aymara: Quchapampa, Quechua: Quchapampa) is a city in central Bolivia, in a valley with the same name, in the Andes mountain range. It is the capital of the Cochabamba Department and is the fourth largest city in Bolivia, with a population of 630,587 according to the 2012 Bolivian census. Its name is from a compound of the Quechua words qucha, meaning "lake", and pampa, "open plain". Residents of the city and surrounding areas are commonly referred to as cochalas, or, more formally, cochabambinos. It is known as the "City of Eternal Spring" and "The Garden City" because of its spring-like temperatures all year round. It is also known as "La Llajta", which means " town" in Quechua. The Cochabamba valley was inhabited for thousands of years due to its fertile productive soils and mild climate. Archaeological evidence suggests that the initial inhabitants were of indigenous ethnic groups: Tiwanaku, Tupuraya, Mojocoya, Omereque, and Inca inhabited the valley at times before the Spanish arrived. The area got its name, from Quechua Kochaj-pampa, as part of the Inca civilization. The area was conquered by Topa Inca Yupanqui (ruled 1471-1493). His son Huayna Capac turned Cochabamba into a large production enclave or state farm to serve the Incas. Possibly depopulated during the conquest, Huayna Capac imported 14,000 people, called mitimas, to work the land. The principal crop was maize which could not be grown in much of the high and cold heartland of the Inca Empire. The maize was stored in 2,400 storehouses (qollqas) in the hills overlooking the valley or transported by llama caravan to storage sites in Paria, Cusco, of other Inca administrative centers. Most of the maize was probably used to sustain the Inca army during its campaigns. The first Spanish inhabitant of the valley was Garci Ruiz de Orellana in 1542. He purchased the majority of the land from local tribal chiefs Achata and Consavana through a title registered in 1552 at the Imperial City of Potosí. The price paid was 130 pesos. His residence, known as the House of Mayorazgo, stands in the Cala Cala neighborhood. The city, called Villa de Oropesa, was founded on 2 August 1571 by order of Viceroy Francisco de Toledo, Count of Oropesa. It was to be an agricultural production centre to provide food for the mining towns of the relatively nearby Altiplano region, particularly Potosí which became one of the largest and richest cities in the world during the 17th century — funding the vast wealth that ultimately made Spain a world power. With the silver mining industry in Potosi at its height, Cochabamba thrived during its first centuries. The city entered a period of decline during the 18th century as mining began to wane. In 1786, King Charles III of Spain renamed the city to the 'loyal and valiant' Villa of Cochabamba. This was done to commend the city's pivotal role in suppressing the indigenous rebellions of 1781 in Oruro by sending armed forces to Oruro to quell the uprisings. Since the late 19th century it has again been generally successful as an agricultural centre for Bolivia. The 1793 census shows that the city had a population of 22,305 persons. There were 12,980 mestizos, 6,368 Spaniards, 1,182 indigenous natives, 1,600 mulattos and 175 African slaves. In 1900, the population was 21,886. Besides a number of schools and charitable institutions, the diocese has 55 parishes, 80 churches and chapels, and 160 priests. In 1999 and 2000, large-scale protests reversed the privatisation of the city's water supply. In January 2007 city dwellers clashed with mostly rural protestors, leaving four dead and over 130 injured. The first democratically elected Prefect of Cochabamba, Manfred Reyes Villa, had allied himself with the leaders of Bolivia's Eastern Departments in a dispute with President Evo Morales over regional autonomy and other political issues. The protestors blockaded the highways, bridges, and main roads, having days earlier set fire to the departmental seat of government, trying to force the resignation of Reyes Villa. Citizens attacked the protestors, breaking the blockade and routing them, while the police did little to stop the violence. Further attempts by the protestors to reinstate the blockade and threaten the government were unsuccessful, but the underlying tensions have not been resolved. In July 2007, a monument erected by veterans of January's protest movement in honor of those killed and injured by government supporters was destroyed in the middle of the night, reigniting racial conflicts in the city. In August 2008, a nationwide referendum was held. The prefect of Cochabamba, Manfred Reyes Villa, was not confirmed by the voters of the department. Cochabamba's famous "Eternal Spring" continues to hold sway over the hearts of true Cochalos. Neither experiencing the humid heat of Santa Cruz nor the frigid winds of La Paz, Cochabamba enjoys a semi-arid climate (Köppen: BSk). At 17° south of the Equator, tropical days are balanced by the cool of mountain nights. The characteristic of the climate is an extended dry season that runs from May until October with a wet season that generally begins in November with the principal rains ending in March. Currently, Cochabamba is among Bolivia's most economically and socially progressive cities. Commensurate with other large cities in the Andean highlands of South America, Cochabamba is a city of contrasts. Its central commercial districts, bounded by Plaza Colón and Plaza 14 de Septiembre, are generally equipped with modern urban amenities and are where the majority of the city's business and commercial industries are based. An active nightlife is centered around Calle España and along the broad, tree-lined boulevard, El Prado. In contrast, the remote area adjacent to the Wilstermann International Airport is visibly impoverished, with adobe homes and unpaved roads, which is often the first impression visitors acquire while commuting into the city. The most widely spoken language in Cochabamba is Spanish. Although the Spanish that is spoken in the Cochabamba region is generally regarded as rather conservative in its phonetics and vocabulary, a few Quechua and Aymara terminology (wawa [child], papa [potato]) have been incorporated into its standardized form. As with most cities around the globe, English language is increasingly spoken and understood, particularly among business-minded indigenous and repatriated Cochabambinos. English-language instruction has become incorporated into Bolivian education from elementary to college levels. The city's racial demographics consist of the following visible groups in order of prevalence: Western Hemispheric indigenous (mostly of Quechua and Aymara ethnicity), Mestizo or mixed Indigenous, and a minority of white Caucasoid and mixed white (Criollos). Cochabamba, formally the municipality of Cercado, is the capital of Cochabamba department. The city government is divided into executive and legislative branches. The mayor of Cochabamba is the head of the city government, elected by general election for a term of five years. The mayor heads an executive branch, which includes six sub-mayors and a variety of departments comprising 950 functionaries. The 11-member municipal council is the legislative branch. The current mayor is José María Leyes of the Social Democrat Movement (MDS for its initials in Spanish). The area where Cochabamba is situated is commonly referred to as the granary of Bolivia. Its climate is milder than that of the Altiplano region to the west and thus permits extensive agriculture, including grains, potatoes, and coffee in the highlands and sugar cane, cocoa beans, tobacco, and fruit in the Chapare tropical lowlands, an area that had been one of the country's main coca-leaf-producing regions. Cochabamba is also the industrial hub of Bolivia, producing cars, cleaning products, cosmetics, chemicals, and other items like cement. 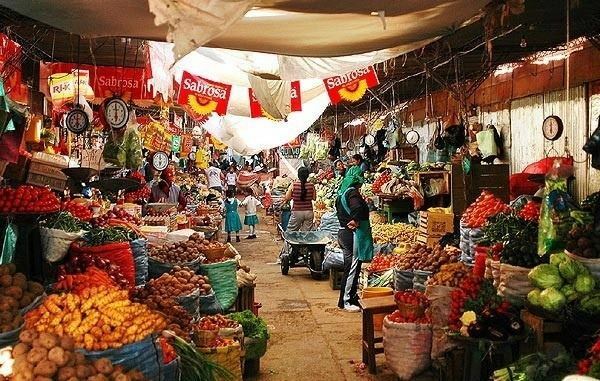 The economy of Cochabamba is characterized by produce goods and services. The airline Boliviana de Aviación has its headquarters in Cochabamba. The defunct airline Lloyd Aéreo Boliviano (LAB Airlines) had its management offices on the grounds of Jorge Wilstermann Airport in Cochabamba. In Cochabamba construction has been rapidly increasing in the last couple of years with more than 750 construction sites per year. Cochabamba is one of the main hubs for cocaine dealers in South America. In June 2012 the Colombian newspaper El Tiempo gained access to intelligence reports that showed that cocaine cartels were the economic force behind condominiums and real estate as well as industries such as meat processing. The metropolitan area of Cochabamba (Vinto, Tiquipaya, Quillacollo, Colcapirhua, Cochabamba and Sacaba) has an extensive transportation system, which cover all the districts. There are almost 70 bus and minibus lines, from A to Z, and dozens of minibuses and taxi lines trufis. Most lines have GPS system for monitoring and regulation of hour (line 1, line 16, line L, Line 3V, line 20, line 30, etc.). The service or commonly called T.RU.FI (taxi con ruta fija) has at least 60 lines; they are identified by signs on the roof of the vehicle showing the route from the initial stop until the final stop is also indicated line number to which it belongs. Cochabamba account generally higher quality basic services in Bolivia, except, probably SEMAPA. Comteco, a company dedicated to the public telephone service to national and district levels, also has Internet service, cable TV, and many others. EMSA Municipal Sanitation Company, responsible for the pickup, transportation, storage and removed from urban waste produced. EMSA covers 88% of the city and collects 400 tonnes of waste are produced per day. Through the municipal government of Cochabamba, special containers made available throughout the city for the storage of solid waste common. The municipality's sole disposal facility, the K'ara K'ara waste dump (Botadero K'ara K'ara), has been the center of a long-running controversy over pollution of the air and groundwater; it is frequently blockaded by neighboring residents demanding changes. In the capital and throughout the department there are many television channels that broadcast on a local, provincial, national or international all day or part of it. The transmission towers that transmit channels nationally and internationally are in the high Cala Cala, Villa Moscu or Villa Taquiña. The city is the home of the University of San Simón (UMSS, for "Universidad Mayor de San Simón"), one of the largest and most prominent public universities in Bolivia. UMSS is the second best university in Bolivia according to QS World University Rankings in 2013, but measured by the webmetric scores as the first one during 2013-2017. Among the private universities in Bolivia ranking between the top ten are the Universidad Privada Boliviana (a prestigious business university), Universidad del Valle (strong university in medicine with large enrollment of international students) and Universidad Católica Boliviana "San Pablo". Other well-ranked universities includes Escuela Militar de Ingenieria "Antonio Jose de Sucre", Universidad Simón I. Patiño, Universidad de Aquino Bolivia, Universidad Adventista de Bolivia and Universidad Privada Abierta Latinoamericana (UPAL). 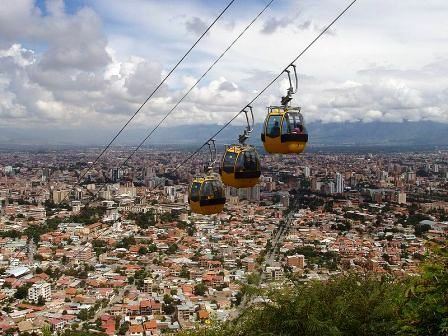 Cochabamba became the second recipient city of Brazilians student in Bolivia after the city of Santa Cruz due to the affordable and good living conditions of the city. Cochabamba is served by the modern Jórge Wilstermann International Airport (IATA code CBB), which handles domestic and international flights. It houses the headquarters of Boliviana de Aviación (BOA) Bolivia's national airline and Lloyd Aéreo Boliviano, Bolivia's former national airline. Other domestic airlines that serve the airport include Amaszonas, Ecojet, and Transportes Aéreo Militar. Cochabamba is a steadily emerging market within the Bolivian real estate industry. Since 2010, it became the city with most surface area in construction in Bolivia overpassing Santa Cruz and La Paz. There are many middle and large buildings under construction by 2012. An annual mild climate, abundant greenery, mountain vistas, and a progressive local economy are factors that have contributed to the city's appeal for Bolivian nationals, expatriates and foreigners alike. Historic and affluent neighbourhoods such as Cala Cala, El Mirador, and Lomas de Aranjuez showcase some of the city's most distinguished residences. Historically, Cochabamba has been a destination for many Bolivians due to relatively improved economic opportunities and a more temperate climate. Bolivia's current President Evo Morales and ex-president Gonzalo Sanchez de Lozada were both Senators representing Cochabamba, although they were born in Oruro and La Paz respectively and immigrated to Cochabamba at the start of their political careers. After the road to the eastern city of Santa Cruz de la Sierra was completed in the 1950s, thousands of people from Cochabamba migrated to the lowlands and permanently settled. Many migrants from Cochabamba and their descendants now identify themselves as Cambas after absorbing the regional Bolivian culture of the eastern lowlands, but maintain familiar ties with relatives that remained in Cochabamba. A large population of Bolivian and Bolivian-descended residents is in the Greater Washington, D.C.-Baltimore–Northern Virginia area of United States (2005 US Census estimates 27,452 +/- 8,883 Bolivians for DC, Virginia, and Maryland); the highest concentration is in Arlington County, Virginia. These figures may represent a census undercount of undocumented Bolivian alien residents. These combined communities have become the centre for recent and established Bolivian immigrants, most of whom are from the department and city of Cochabamba, hence, locally regarded as Little Cochabamba or Arlibamba. Little Cochabamba contains Bolivian-cuisine restaurants and the Escuela Bolivia; a school-within-a-school programme for children and adults. After to the mid-1990s, many people from Cochabamba with a low income emigrated to Bergamo, Italy in search of work. Most of the 16,400 (2005 estimate) Bolivians in Bergamo are from Cochabamba which includes both legal and work visa-expired immigrants. This migration is due to the strong relationship between the Roman Catholic Diocese of Bergamo and the Archdiocese of Cochabamba. Guido Ernesto Cabrerizo (1954), author and poet.